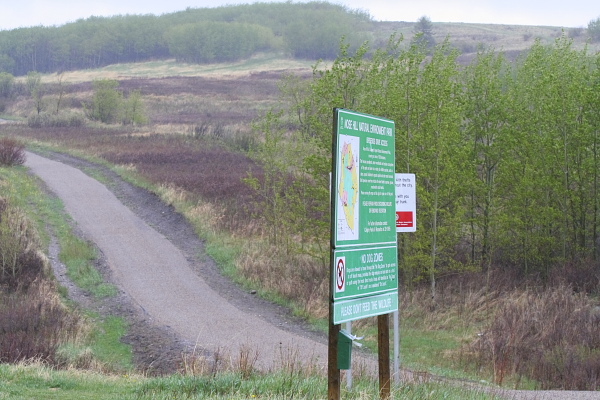 Dogs should be on-leash on the escarpments and in the coulees on Nose Hill, to protect the wildlife and to ensure adequate control of the dogs. On the plateau of the Hill dogs may be off-leash. Dogs are allowed off-leash in designated areas only. All dogs must be under control at all times. For example, dogs should always come when called. Nose Hill Park is for public use, there are other people, other dogs and cyclists using the Hill. Keep in mind that the safety of everyone is of primary importance. Do not allow your dog to rush up to unfamiliar people, some people are uncomfortable with dogs. Do not allow your dog to approach other dogs that are on-leash. A dog that is on-leash may be aggressive. When cyclists are passing, keep your dog a safe distance away to avoid collisions. Do not allow your dog to chase wildlife. Cyclists must use extra caution while passing people with dogs. Use a bell or your voice to warn others when passing. Expect to encounter dogs off-leash in off-leash areas. Dogs that are off-leash are usually friendly. If you are uncomfortable around dogs, pay no attention to them. Reacting suddenly to a dog may cause it to feel nervous. Do not allow children to touch unfamiliar dogs without the owners permission.